Comic Cards Cavalcade Episode 098 – WORST. COMIC. PODCAST. EVER! 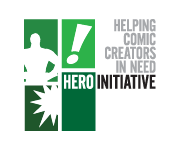 The Hero Initiative is the first-ever federally chartered not-for-profit corporation dedicated strictly to helping comic book creators in need. Hero creates a financial safety net for yesterdays’ creators who may need emergency medical aid, financial support for essentials of life, and an avenue back into paying work. It’s a chance for all of us to give back something to the people who have given us so much enjoyment. Since its inception, The Hero Initiative (Formerly known as A.C.T.O.R., A Commitment To Our Roots) has had the good fortune to grant over $700,000 to over 50 comic book veterans who have paved the way for those in the industry today. 60 Second Review Batman Comic Cards Cavalcade Comic Images Cullen Stapleton Dark Horse Comics DC Comics Eclipse Enterprises Essential Showcase Fantastic Four FCIW Flash Four Comics I Want Image Comics Jack Kirby Jason Aaron Jerry McMullen Kansas City Comic Con Marvel Marvel Comics Pick 3 Planet Comicon Review San Diego Comic Con Skybox International Spider-Man Star Wars Supergirl Superhero Yearbook Super Hero Yearbook Superman The CW The Definitive Directory Of The DC Universe The Official Handbook Of The Marvel Universe Thor Throwback Thursday Valiant Comics Vertigo Comics Who's Who Worst Comic Podcast EVER!